"Big Mike in Special Olympic"
News from March 22, 2006 . . . Big Mike is now in his second year on the New Jersey Special Olympic basketball team. Won all but one regular season game. Was in the North Sectional Basketball Tournament at Drew University on March 12, 2006. His team won both games and got GOLD. Mike's team went to the NJ State Finals on March 18 and 19, 2006 in Wildwood, NJ. Won 2 out of 4 games. Which placed the team in third place in Division Four. Mike wore a temporary ugly glasses guard till he get a real sport glasses for the 2007 basketball season. The good thing about the 2006 basketball season is this. They spelled Mike's last name right. SMILE!!! 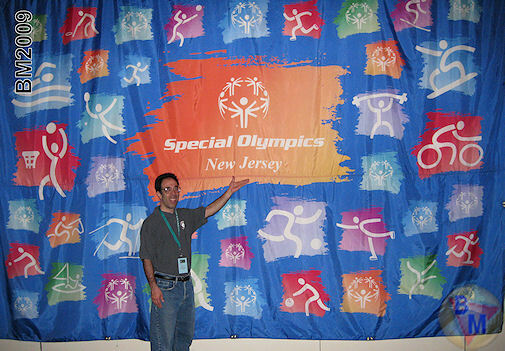 Big Mike started in the North Regional New Jersey Special Olympic basketball in 2005. Mike use to watch his friends play. Was a cheerleader for a few short years. Then tried to get on the team in 2004 season. But had no luck. Mike was finally on a team for 2005 season. Mike's first game was a rough one. Him and one of his team friend collided as they both jumped for the ball during the first half of the game on January 16th, 2005. Hurting his nose from the collision. Mike has improved and so did his friends on the team. The team was undefeated during the regular season in 2005. Then won in the Regional Sectional at Drew University on March 13th, 2005. Then the State Elimination at FDU in Madison, NJ on March 19th and 20th, 2005. Lost on the 19th. Then won the first game and lost the second game on the 20th. We came in 4th place overall in Division Three. Mike had a good time being on the team. Mike has been on the Area Special Olympic bowling league for his third year now. Just recently finished on May 11th, 2006 and a party on May 18th, 2006. Mike likes to try and improve his game. His final average for the 2005 - 2006 season was a 147. Mike got a high of 202 game in April 2006. His first time getting that high in a league. Mike has gotten 200 plus a few times when he is not bowling on a league. 2007 basketball season was alright. The team lost one regular game. Came in 2nd place in the Sectional Game at Drew. Then 4th place at the Finals in Wildwood, NJ. We played the best we all can. 2006-07 bowling league. Did good. At the end of the 2007 bowling season. My average was a 137. Came close of hitting a 200 a couple of times. 2007-08 bowling season is going off great. I hit above 200 a few times. Bowling average currently as of March 11th is a 149. No complaint here. Had a special basketball fundraiser in Febraury 2008. To raise money for the Special Olympic. Raised over $7,000 that one night in February. 2008 basketball season is going great. But do not want to have a big head here. The team I am on has changed name. Sorry for not saying what the team name is. I do not have permission to do so. Anyway, we have won every single regular game. Sectional game has passed. The team I am has won one out of three games at FDU. My team won 3rd place in the North Sectional Game. The 3rd game was intense. So close! The 3rd game was to decide who get 2nd place? The team I am on lost by one point. It was a great game. No matter what anyone says. Now the State Finals for March 2008. My team came in 3rd place overall in our divison. We are all happy. Had a great time and enjoyed the nice weather in Wildwood, NJ. 2009 basketball season had three teams and 2 extra per team. Mike is on A team. Team A only lost 2 games in the regular season. Mike sprained his right ankle Febraury 8th. Was out of the game for the rest of Febraury. So his right ankle can heal. Mike returned back the first sunday of March. Was slow most of the game. Then the Sectional came up. Got 2nd place in our Division 3. The State Finals was not that good. Mike was not 100%. Only Team A and Team B made it to the State finals. Mike got stepped on and again . . . . sprained his right ankle. Facing the toughest twam was the first day of tourney. Came in 4th place over all in Division 3. We tried our best. 2010 basketball season was plaqued by two snowstorms and a accident to a friend. This year we only had two teams. Team A and Team B. More extra players and some players was cut. Know one burning out this year. Thank goodness!! Lost only two games in the reglar season. Two games was cancelled by two bad snowstorms. A friend broke his wrist on left arm during basketball in the middle of Febraury. But was there in support of his teammates. We qualify to be in Division 2. Because we got good. The better a team is. The lower a team will be placed in a Division. The Sectional was a good one. Played 4 games total. 2 games saturday and 2 games sunday. Mike made it for the State Finals for the 6th. Do not know how many times the team made it before him. Mike friend was there in support. We played 4 tough games. We all tried our best. Can not ask for a better 4 games. The team placed in 3rd overall in Division 2. We all did come home with a smile on our faces. No problem!! Now we wait for 2011 season. Will come fast. Everyone play sports the best they can. They also enter the Special Olympic to make friends, enjoy themself or maybe wanna improve themself. No matter what disability you have. Should never give up on things. Follow your dreams. Do not ever let disability get in your way.